It is possible for a business to operate with the single entry bookkeeping system if the business is new or the business transactions are low in volume and uncomplicated. 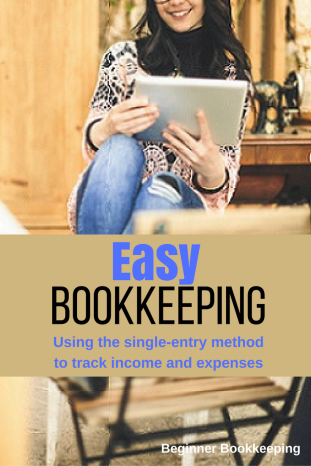 Single entry bookkeeping is an easy way to step yourself into accounting! And it’s cheap because you do not have to invest in bookkeeping software. This method of bookkeeping is a simple record of income and expenses using a manual cash book and calculator, or a spreadsheet in a self-calculating program such as Open Office, Microsoft Excel or Quattro Pro. 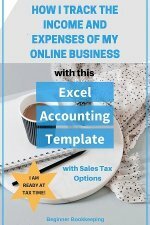 "10 Bookkeeping Forms and Templates". Included are completed examples and a mini guide for both single entry and double entry bookkeeping. Click here to get the template. It opens in a new window - from there you can save it to your device. Click here to check out all our other printable forms. If you are keen on starting with single entry bookkeeping for your budding business, then take a look below at the sample of a cash book/spreadsheet. It’s very easy to set one up just like it to track your income and expenses. The Date - This is the date of the transaction which you can get off the accounting source documents. Description - A brief description of the transaction. You can put whatever information you feel necessary, but don’t overdo it! Reference - You can basically choose whatever reference will help you identify the transaction. Some people use the invoice numbers, or the initials of the type of payment transaction (like DC for Direct Credit). The reference can be written somewhere on the transaction document, if it’s not on there already - like an invoice number. This is a good way of cross referencing the transaction and payment between the cashbook and the document. Income/Expenses - Simply insert the value of the transaction into the appropriate column... is it money coming in to the business or money going out of the business? You could change the headings to ‘Money In’ and ‘Money Out’ if you prefer. 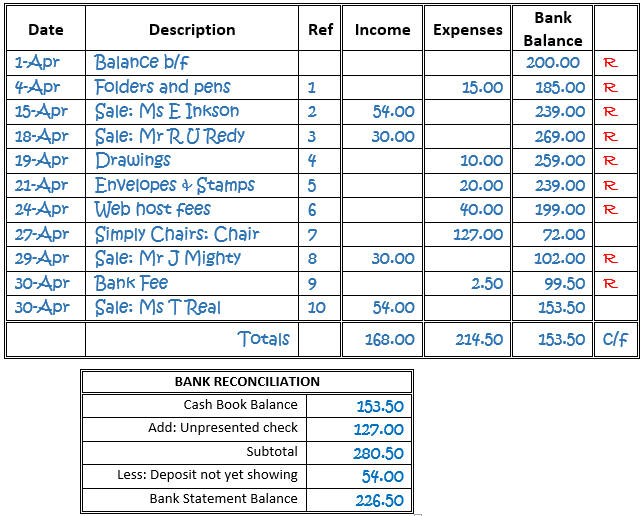 Bank - This is a running balance column that changes each time a transaction is entered. Add the income, subtract the expenses. Notice on 01 Apr there is an opening balance. This is the balance taken from the last day in March and brought forward (b/f) to Apr. It can also be called b/d - brought down. 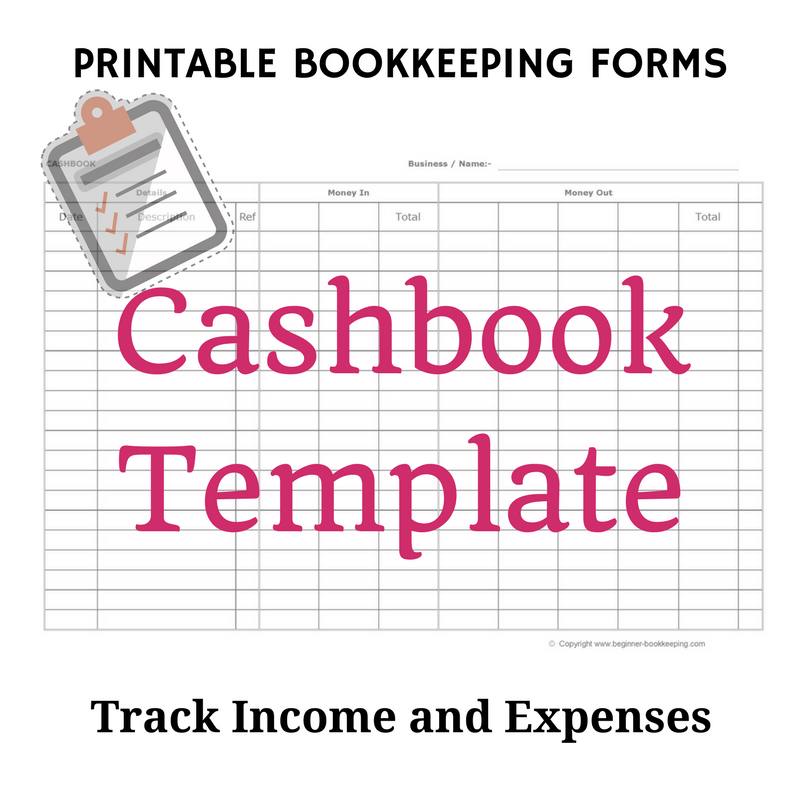 You can find out more about the cashbook format and design your own one if you prefer to suit your requirements. This is done to match the cashbook total to the bank statement total for the end of April. You just need to go through and tick each cash book item that has a corresponding entry on the bank statement. Or you can put an R for reconciled as the example above shows. Also included in the reconciliation is the check of $125.00 - this was already written in the cash book but as at the end of April the supplier had not yet presented it to their bank so it is ‘added back in’. The deposit made of $54.00 is yet to be taken to the bank by our bookkeeper so this has to be ’taken away’. Do not include any transactions in the cash book that are never going to be reflected on the bank statement. The two should always be in agreement. Learn more about bank reconciliations here, and you can practice Bank Reconciliation Exercises with Answers here. A separate column is made for each sale item and each expense item, and totaled. This is a great way of keeping closer tabs on how much you are receiving or spending for each income or expense type. These separate columns are what make up the ‘accounts’ of a bookkeeping system i.e. bank account, stationery account, internet account and so on. With this extended sheet it is wise to double check that the totals going across the sheet add up to the totals going down the sheet and so maintaining the accuracy of your accounts. The difference between the Income and Expenses is written just below the Income Bank column as the ‘c/f’ figure. Carry on with a bank reconciliation as per previous example. One of the most important things you can use this single entry bookkeeping spreadsheet for is to make a report - the Profit and Loss report (also known as an Income Statement). 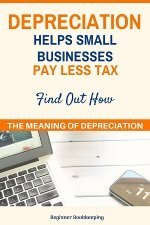 This report is very simple - it is the total Income minus the total Expenses equals your Net Profit (or loss). Why should you do this report? So you can see if your business is worth operating. If it makes a profit - great! If it makes a loss (in other words, your income does not cover your expenses), not so great. If it continues to make a loss, you need to decide what to do to turn things around and make a profit. Go here to learn more about the profit and loss and get a template. If at some stage you require a balance sheet, you can pass on the single entry bookkeeping records to your accountant. He/she will also need to know how much your customers owe you and how much you owe your creditors. Then your accountant will enter your totals into a double entry bookkeeping system and produce a balance sheet. If you want to make a balance sheet yourself read more about balance sheets here and keep in mind that it is more difficult to pull together than a profit and loss report. Your bank may request one if you apply for a loan. If you decide to sell your business a prospective buyer will most likely want to look at it. Why? Because a balance sheet shows the financial condition of your business and whether or not it is viable. If you like using Microsoft Excel, check out our Excel Cashbook. It is based on this single entry bookkeeping spreadsheet but it includes a profit and loss report and a balance sheet that update automatically as you enter the figures. 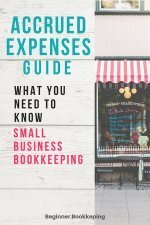 Once your business grows and you’re able to process a cashbook with confidence you can move on from single entry bookkeeping and learn how to do double entry bookkeeping.